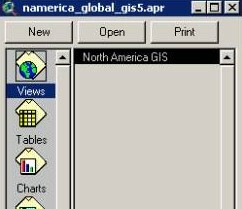 Only users who have a full version of ArcView can continue with this section. In this part, you will incorporate the recent earthquakes as recorded on the USGS National Earthquake Information Center into your GIS so that you can further analyze them. There are choices at the end of the current earthquakes list. Select "comma-delimited earthquake list" to see it in the web browser window. Click once on Tables in the project window. What kind of file did you save above (.dbf, INFO, or .txt?) ___________[b]. In the lower left of the window, change the field to your answer in [b]. Find your text file in your folder and click OK. Your table name should now appear in the list of tables along with a window with the data. Go to the View menu on the top and select Add Event Theme. Find your table current.txt. Think of the Cartesian coordinate system from mathematics. Draw it below. Which field is “x” - longitude or latitude? Which field is “y” - longitude or latitude? In the dialog box, indicate the correct fields for latitude and longitude based on your answers above. Make the new theme appear by clicking on the small check box next to it. Access the table . How many earthquake epicenters are in your view? How does this answer compare to your answer in [a] above? Why? How does the spatial extent of the current earthquakes compare to the spatial extent of the North America data? Why? Compare the pattern of earthquakes over the past week to the earthquakes from North America dataset. How many earthquakes last week were in North America? Do the new earthquakes follow the existing pattern? Why or why not? Create a print of your map. All the information you wish to include in the final plot will be in a "layout." Zoom to your state or region. Determine which themes you would like shown in your plot. Click on View -- > Layout. Use the text button to add text to your layout. Date the map was created. Print your layout to a printer by accessing: File--> Print. Save your project using Fileà Save As. Place it in an appropriate folder. What is your project’s name? GIS allows for spatial data to be viewed in different map projections. Next, you will change the projection of your data so that you can examine North America's earthquakes from the west coast. Change the “projection” under View-->Properties to a custom orthographic projection, with a central meridian of 120 west longitude and a reference latitude of 20 degrees north. Using this new projection, answer the following questions. How does this compare to your old projection? Scroll your mouse in the view. Are the coordinates in the upper right still in latitude and longitude? Why or why not? Congratulations! You have completed this part of the assignment and have contributed much to the understanding of earthquakes in North America. Indicate what you consider to be the most surprising thing you have learned in this part, the most interesting thing, and the most significant thing.